Sprague’s “Texas Adventure” involved a treasonous scheme to sell arms to Confederates in order to buy cotton; publicity about it was suppressed by Secretary of War Edwin Stanton. Sprague defied his father-in-law when he voted for Andrew Johnson’s impeachment—a vote which was probably dictated by his vulnerability to legal reprisals from Stanton. 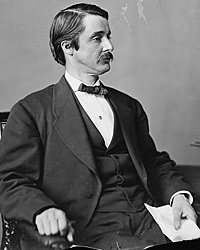 Sprague financially supported his father-in-law’s abortive search for the 1864 presidential nomination but chafed at any additional personal and political financing. His marriage with Kate ultimately floundered and broke up on the rocks of jealousy, infidelity, emotional incompatibility and bankruptcy. 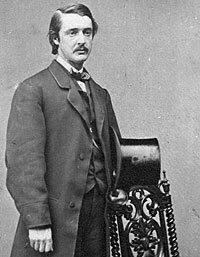 By the late 1870s, their lives were a public scandal, punctuated by Sprague’s attack on New York Senator Roscoe Conkling, with whom Kate was romantically involved. Sprague’s wealth rested on a variety of enterprises, including a steamship company, a railroad company, foundries and mills, and vast land holdings. William B. Hesseltine, “Lincoln’s War Governors,” Abraham Lincoln Quarterly, Volume IV, No. 4, December 1946, p. 161. Michael Burlingame, editor, With Lincoln in the White House: Letters, Memoranda, and Other Writings of John G. Nicolay, 1860-1865, p. 125 (Letter of John Nicolay to John Hay, January 29, 1864).